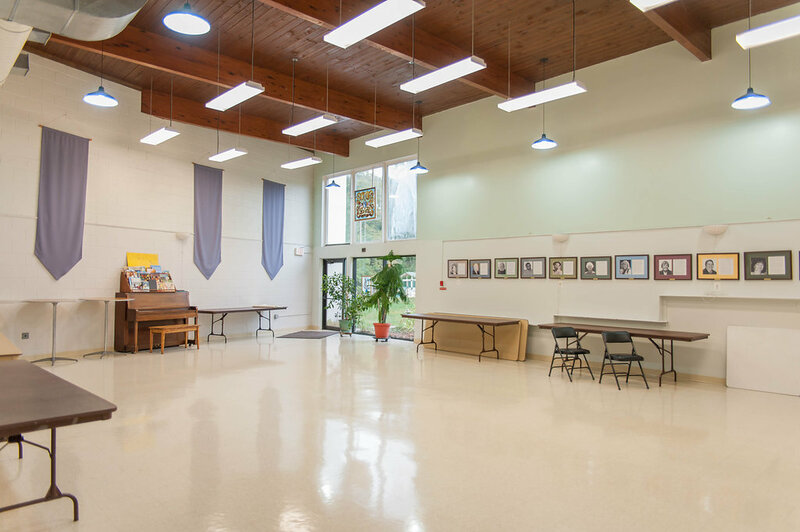 The Unitarian Universalist Church at Washington Crossing (UUCWC) offers facilities to rent for events, gatherings, and recurring meetings. The comfortable and welcoming meeting rooms/classrooms and unique gathering spaces can accommodate groups of all sizes, from just a few to up to 250 people. UUCWC also offers a licensed commercially certified kitchen. 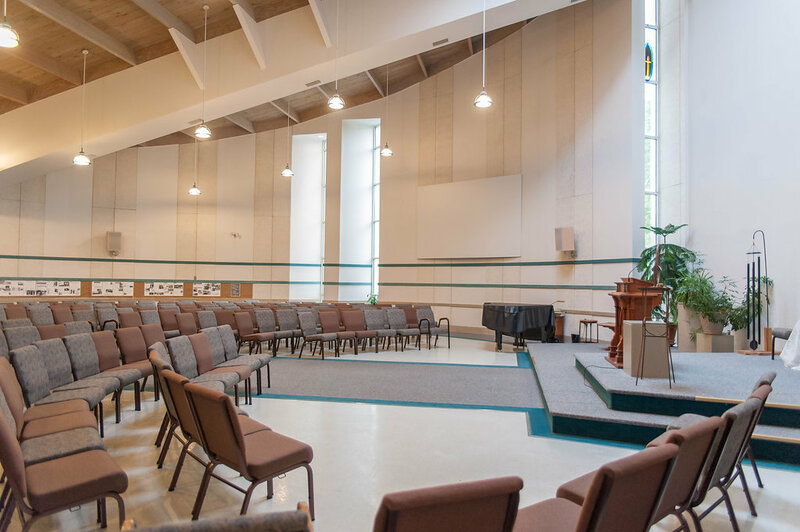 Located on the main floor, the round sanctuary offers a soaring space, with floor to ceiling windows and a skylight, that provides a beautiful light-filled environment for weddings, child dedications, memorial services, and other religious and family events, as well as for lectures and larger meetings. The exceptional acoustics also lend themselves to concerts and recitals. Its circular design and upward-angled ceiling create a fluid space that both embraces community and reaches for the heights. This air-conditioned room can comfortably seat 250 people. Available for additional fees are a Yamaha piano, built-in in sound system, microphones and a large projection screen. Please note that food and beverages are not permitted in the sanctuary. This round space is approximately 75’ by 70’. The Crossings Room on the lower level can be used for rehearsal dinners, mid-sized meetings or forums, showers, birthday parties, and small conferences. It can accommodate 100 people seated “auditorium style” or 10 banquet-style tables that will each seat 8 people. Eight-foot tables and folding chairs are available from the church. The Crossings Room has easy access to our commercially licensed kitchen. This light-filled, air-conditioned, tile-floored space is approximately 29’ by 38’. 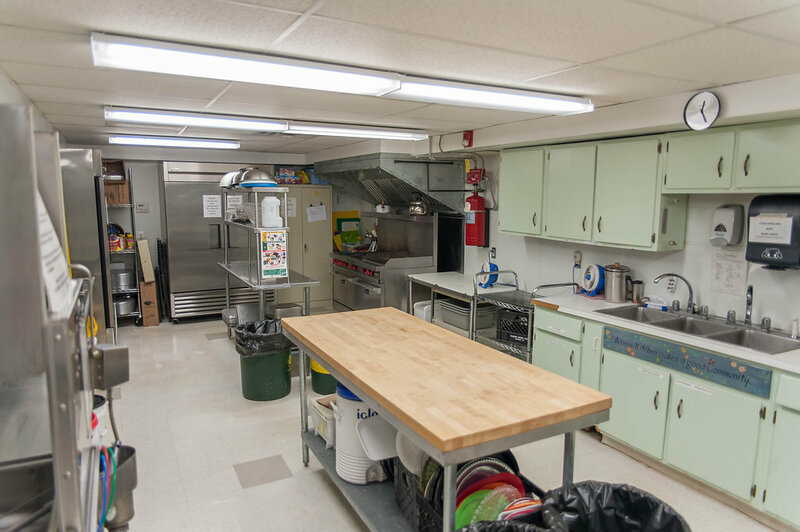 Our commercially licensed, modern kitchen, adjacent to the Crossings Room, is available for full use for ServSafe certified users (preparing from raw, use of stove, use of dishwasher) or for light use (reheating, warming, use of dishwasher). It offers stainless sheet and butcher block preparation spaces, a refrigerator, a three-bay food prep sink and a three-bay washing/sanitation sink as well as a commercial dishwasher. Our upper level includes three air-conditioned meeting rooms available for rent for smaller meetings on weekdays, weeknights, and weekends (except Sunday mornings), depending on availability. All include adult seating and two of our classrooms include a television screen suitable for dvd or cabling to laptop for presentation/webinars. 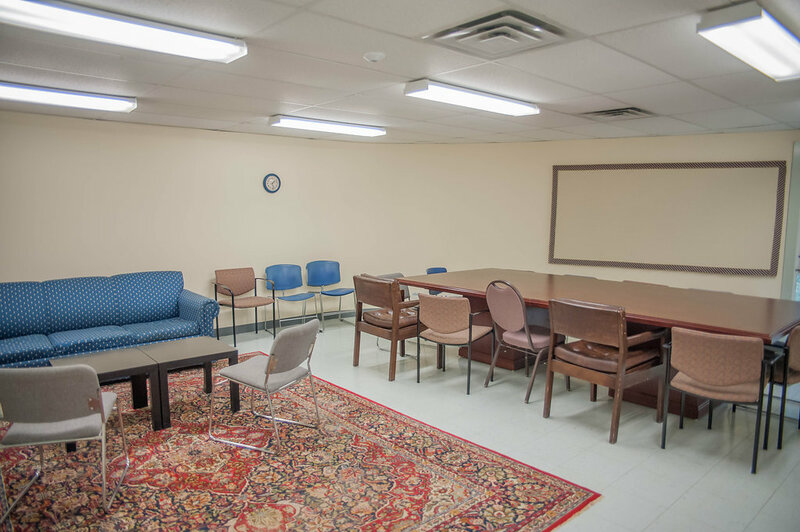 Room sizes vary but are all at least 15’ by 21’ and can comfortably seat up to 15-20 people. Wi-fi is available in all rooms. Wireless Internet access is available with your wi-fi enabled computer throughout the building. The upper and lower levels are accessible by ramp from the outside of the building. Inside, a wheelchair lift can take people up or down the main stairway. The front door and upper-level restroom doors are handicapped accessible. Special rates are available for non-profits and church members. All renters must obtain event liability insurance; the UUCWC office has information about online providers. Renters are responsible for setup and cleanup after use or can arrange for these services for an additional fee. Depending on the room desired, our rooms are available for hourly, daily, weekly or longer rentals. To schedule a visit to view the rooms, make a reservation, get pricing and inquire about other details, contact the UUCWC office at (609) 737-0515, Monday through Friday between 10:00 am and 2:00 pm. You may also leave a message after hours and we will respond promptly.